(CNN) -- CNN's Larry King talked with Republican Gov. 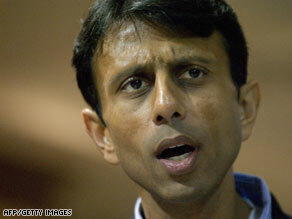 Bobby Jindal in a prime-time exclusive interview Monday night. Lousiana Gov. Bobby Jindal on Barack Obama: "I'm certainly not nearly as good of a speaker as he is." Jindal gave the Republican response after President Obama's address to Congress last week. Jindal received negative reviews after the speech, and Larry asked him how he felt about that. They also talked about the war of words in the Republican Party centered around Rush Limbaugh. Larry King: Governor, you took a lot of flak for that speech. Were you surprised that you did? Gov. Bobby Jindal: Let's be clear, the president is a great speaker -- probably the greatest we've seen in a generation. I'm certainly not nearly as good of a speaker as he is. And I'm not the only one that's got that opinion. I hope people look at the content of the speech, not just the delivery. You know, for years, I've been told I speak too quickly. Now I'm told I speak too slowly. Let's cut taxes. Let's get rid of the wasteful spending. That's the debate. That's the discussion we need to be having. King: But governor, to say that the federal government apparently has no voice in this crisis, when in some cases, they are the only answer, that pointed to a lot of the criticism, didn't it? Jindal: If the president had actually delivered the targeted temporary stimulus package that he described, I think you'd see a lot more conservative and Republican support. We absolutely agree with the kind of infrastructure spending he describes -- speeding up federal spending that would have happened anyway. Fundamentally, I don't think $30 million for the federal government to buy new cars, $1 billion for the Census, $50 million for the National Endowment for the Arts is going to get the economy moving again as quickly as allowing the private sector to create jobs. King: There was no criticism of the Bush bailout of the automobile industry. No criticism of the last eight years of the Republican leadership with a tremendous deficit. I think one of the reasons we lost elections was that the Republicans came to Washington to change the culture and instead became captive of that culture. The Republican Party defended spending and corruption we never would have accepted from the other side. King: Governor, if perception is reality, do you think your speech hurt the party? Jindal: I think that people are going to look at the content. I think people are going to be focused now that we've [got] alternative views on how to move our country forward. Let me begin the first to say we want to work with the president every chance we can get. Whenever we can find areas of agreement, we need to work across the aisle and put America first. But when we disagree, we need to offer principled alternative solutions. So for example, in health care, I agree with the president that health care should be affordable for every American. I just don't think it should be a government-run program. King: All right, governor, here was Rush Limbaugh at this weekend's CPAC Conference. Watch. Rush Limbaugh: What is so strange about being honest and saying I want Barack Obama to fail if his mission is to restructure and reform this country so that capitalism and individual liberty are not its foundation? Why would I want that to succeed? King: Governor, do you think people are thinking about capitalism now or are they thinking about problems? King: What if they work? Jindal: This is where we have a fundamental disagreement. I don't think it's going work ... to spend in excess of our revenues. I want my country to succeed. But what I worry about is that simply spending money on new programs. Look at every new bailout. You talked about the auto bailouts. Then you had the fourth, I think it's the fourth -- it's hard to keep track -- AIG bailout today. It seems like every time you turn around, there's another trillion dollar plan. King: One more thing. It may be moot now, but RNC Chairman Michael Steele took some shots at Limbaugh and then apologized. What do you make of all of that? Jindal: Well, I didn't follow the day's events. I'm glad he apologized. I think the chairman is a breath of fresh air for the party. As I said before, I think Rush is a leader for many conservatives and says things that people are concerned about. [He] articulates very well the concern people have about growing government spending without an end in sight. King: Thanks, governor. We'll call on you again. Always good seeing you.